India and Vietnam are expanding their strategic partnership from energy and trade to defense and space — and beyond. In 2015 Vietnam will become the country coordinator for relations between the Association of Southeast Asian Nations (ASEAN) and India for a three-year term ending in 2018. This will be an important partnership because the strategic interests of both countries markedly converged in 2014 and are likely to continue on this trajectory. The new government in India led by Prime Minister Narendra Modi views Vietnam as an essential partner for its Act East Policy. Modi has injected new momentum in the 2007 India-Vietnam strategic partnership. For example, President Pranab Mukherjee visited Hanoi from September 14-17 and Prime Minister Nguyen Tan Dung made an official visit to Delhi from October 27-28. To underscore this point President Mukherjee announced that the Export-Import Bank of India had signed a $100 million line of credit agreement with Vietnam’s Ministry of Finance, with an annual interest rate of two percent, to facilitate defense procurement over the next decade and a half. In the past Vietnam lacked funds and used barter and/or partial payment to procure military equipment. 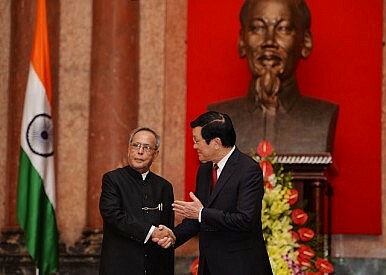 Mukherjee also agreed to expand military training and assist Vietnam Navy’s strike capabilities. In addition to defense and security, the joint statement enumerated five additional areas of cooperation: political, economic, science and technology, culture and people-to-people links, technical, and regional and multilateral diplomacy. Seven agreements across a number of areas were signed during Mukherjee’s visit indicating the growing breadth of bilateral relations. Our defense cooperation with Vietnam is among our most important ones. India remains committed to the modernization of Vietnam’s defense and security forces. This will include expansion of our training program, which is already very substantial, joint exercises and cooperation in defense equipment. We will quickly operationalize the 100 million dollars Line of Credit that will enable Vietnam to acquire new naval vessels from India. We have also agreed to enhance our security cooperation, including counter-terrorism. In private discussions the two prime ministers agreed to work with Japan in a trilateral format to coordinate positions on security and economic policies. The joint statement issued by Modi and Dung at the conclusion of the latter’s visit included important commitments in five areas: defense, South China Sea, energy, trade and investment, and space. The joint statement noted that after reviewing past defense cooperation the two prime ministers were satisfied by the progress made and committed themselves to stepping up defense relations. India-Vietnam defense cooperation currently entails: high-level exchange visits, an annual security dialogue, service-to-service interaction, naval port visits, ship construction, training and capacity building, assistance in maintaining military equipment, multilateral exercises, and cooperation at regional forums such as the ASEAN Defense Ministers’ Meeting Plus. Vietnam will use the lion’s share of the $100 million line of credit to procure four new Ocean Patrol Vessels (OPVs). The OPVs are capable of performing constabulary duties such as coastal surveillance and anti-piracy missions, as well as military missions. Vietnam is now considering whether to approach a government or private shipyard to build the new vessels. When a contract is agreed it will mark the first significant transfer of military platforms by India to Vietnam. Vietnam is also exploring the possibility of acquiring Indian-manufactured surveillance equipment such as unnamed aerial vehicles. On the eve of Prime Minister Dung’s visit, P. K. Chakravorty, adviser to BrahMos Aerospace, revealed that Russia had agreed to sell the BrahMos hypersonic cruise missile to Vietnam. The BrahMos missile is an Indian-Russian joint venture and requires the agreement of both governments for the sale to a third party. Discussions between India and Vietnam over the sale of the BrahMos missile and the naval platforms to carry them reportedly were at an advanced stage. No announcement on the sale of the BrahMos missile was made during Dung’s visit or subsequently. Media reports indicate that for the first time India has sent a clear signal that it may be willing to sell the BrahMos to Vietnam. The sale of the BrahMos appears contingent on India joining the Missile Technology Control Regime first. India also agreed to continue to assist Vietnam in maintaining common equipment of Russian origins in both countries’ inventories. In October 2013 India commenced underwater combat training for Vietnamese navy personnel to operate Vietnam’s new advanced Kilo-class submarine fleet. India will train up to 500 Vietnamese submariners in batches of 50 over a year-long program for each batch. Pilot training will represent a significant new development. India has provided training in information technology and English language skills to the Vietnamese military. On October 28, India and Vietnam signed a memorandum of understanding (MOU) to establish the joint Vietnam-India English Language and Information Technology Training Center at the Ministry of National Defense’s Telecommunications University in Nha Trang. India has also agreed to assist Vietnam in capacity building for participation in UN peacekeeping operations. The joint statement issued by Modi and Dung basically reiterated the wording on the South China Sea in the joint statement issued by presidents Mukherjee and Sang the previous month. The key elements of both statements include: agreement that freedom of navigation and overflight should not be impeded, all parties should exercise restraint, avoid the threat or use of force, and resolve disputes peacefully in accord with international law. Both statements supported the implementation of the Declaration on Conduct of Parties in the South China Sea and adoption of a Code of Conduct in the South China Sea. Finally, both statements called for cooperation in ensuring security of sea-lanes, maritime security, combating piracy and search and rescue operations. The Modi-Dung joint statement issued on October 28 noted that business leaders from India and Vietnam identified 13 priority areas: hydrocarbons, power generation, infrastructure, tourism, textiles, footwear, medical and pharmaceuticals, information and communications technology, electronics, agriculture, agro-products, chemicals, machine tools and other supporting industries. Cooperation in the field of hydrocarbons represents the second most important component of the India-Vietnam strategic partnership. India’s Oil and Natural Gas Company Videsh Ltd. (ONGC/OVL) has been active in Vietnam since 1988, when it was awarded an exploration license for Block 06.1 that is still producing natural gas. In 2006 ONGC acquired exploration Blocks 127 and 128. Block 127 was later relinquished on commercial grounds. In 2012, when China objected to ONGC’s exploration activities in Block 128, ONGC tried to return the block to Vietnam but was dissuaded after intervention by the Department of External Affairs. In November 2013, Vietnam offered ONGC five blocks. During Prime Minister’s Dung visit to India in October, ONGC signed a Heads of Agreement with PetroVietnam Exploration Production Company Ltd. (PVEP) for exploration in Blocks 102/10, 106/10 and 128. The agreement called for ONGC to take 40 percent equity in Block 102/10 and 50 percent in 106/10, both of which lie outside the waters claimed by China. PetroVietnam agreed to take 50 percent equity in Block 128 and thus spread the risk. Also in October, India’s ONGC signed a MOU with PVEP, a wholly owned subsidiary of the Vietnam Oil and Gas Group, for joint exploration in nine blocks located in ONGC’s New Exploration Licensing Policy (NELP) Blocks. Five of the blocks are in the Cauvery Basin (both onshore and offshore), while the remaining four are deep-water blocks in the Andaman-Nicobar basin. This marks a major step up in energy cooperation. Vietnam promised India that it would extend full security to Indian oil companies operating in its Exclusive Economic Zones in South China Sea. Two-way trade between Vietnam and India reached $5.2 billion in 2013 and is expected to reach $8 billion this year. Vietnam’s Ambassador to India, Nguyen Thanh Tan, estimates that two-way trade could rise to $10 billion in 2015 and $15 billion by 2020. Vietnam is currently India’s tenth largest trade partner. Vietnam’s exports to India include electronics (mobile phones and components, computers and electronic hardware), natural rubber, chemicals, coffee and wood products. Vietnam imports animal feed, corn, steel, pharmaceuticals and machinery from India. During Prime Minister Dung’s visit to Delhi, India offered a $300 million line of credit for trade diversification and strengthening of commercial ties. The line of credit will enable Vietnam to import more polyester fabrics and yarns from India. Currently nearly half of Vietnam’s imports of raw yarn and fabrics come from China. India’s offer of a line of credit is aimed at diversifying Vietnam’s source of materials and thus reduce its dependence on China. India ranks 30th on Vietnam’s investment ladder. Figures for the number of projects financed by Indian direct investment vary from 69 to 84 as of September 2014. Indian capital is concentrated in oil exploration, mineral exploitation and processing, chemical manufacturing, information technology, sugar and agricultural processing. The figures for the amount of Indian invested capital vary from $254 million to one billion. During Prime Minister Dung’s visit, Vietnamese officials and businessmen encouraged Indian investment in areas of particular expertise such as infrastructure (railways), power generation and distribution, international bidding for projects in Vietnam, information technology, education, pharmaceutical research and production and agro-products. Vietnamese investment in India totals a modest $23.6 million. Space represents the fifth major area of India-Vietnam cooperation. The leaders’ joint statement of October 28 called for cooperation in space applications and the launch of Vietnam’s satellites. The leaders also called for the completion of the Satellite Tracking and Data Reception and Imaging Center in Ho Chi Minh City. Vietnam is poised to play a greater role in facilitating India’s Act East policy both as a formal strategic partner and as the next ASEAN country coordinator for relations with India. India’s new role should be welcomed by ASEAN members as it will add ballast to ASEAN’s efforts to maintain regional autonomy in Southeast Asia and a multipolar balance in ASEAN’s relations with external powers. Geo-strategic interests between India and Vietnam are markedly converging. Both share similar concerns about maritime security and Chinese muscle flexing. Not only has India offered substantial support to Vietnam’s navy and air force but political-diplomatic support for Vietnam’s South China Sea policy. Both India and Vietnam will benefit from the development of Vietnam’s offshore hydrocarbon resources. India is seeking new markets while Vietnam wants to enhance its economic heft. India’s new role is not disinterested. Indian strategists have long called for stepping up relations with Vietnam to exert pressures on China as a response to China’s quasi-alliance with Pakistan and the pressures this brings on India. More recently, Indian strategists have called for stepping up relations with Vietnam as a response to Chinese in-roads in the Indian Ocean region especially with Sri Lanka. Vietnam promotes a multilateral balance in its relations with the major powers. Vietnam may soon import the BrahMos cruise missile from India.